The samurai Sanada Yukimura (真田幸村), exiled to Kudoyama (九度山) after the Battle of Sekigahara (関ヶ原の戦い), receives a visit from his wife Chikurin-in (竹林院). 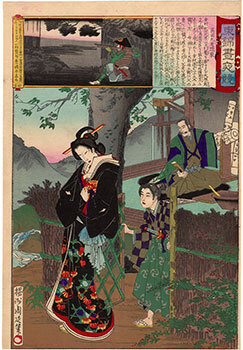 The noblewoman, who is not allowed to meet him, asks her little son Sanada Yukimasa (真田幸昌), at the center of the scene, to give her a mirror to be able to see at least the reflected image of her husband. 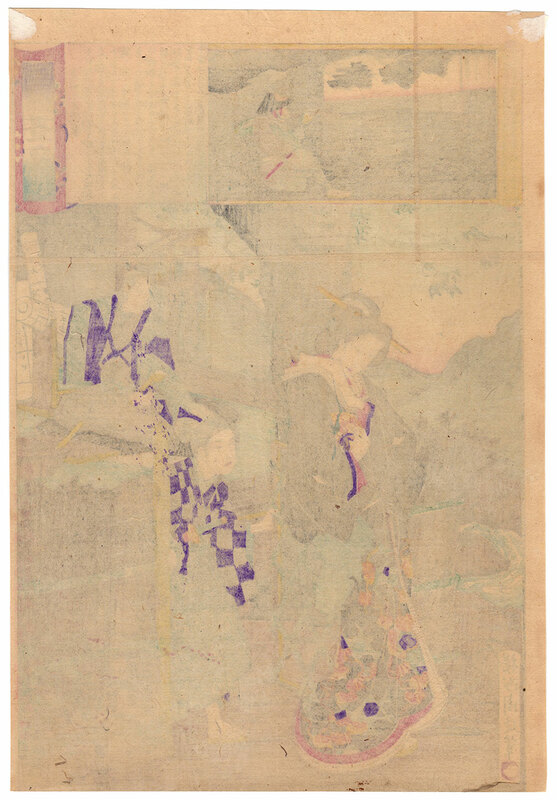 The beautiful woodblock print presented here is titled "Sanada's Hiding Place on Mount Kudo" (真田九度隠家) and is taken from the series "Embroidery Pictures, Comparison of the Day and the Night" (東錦昼夜競), made in 1886 by the famous artist Toyohara Chikanobu (豊原周延). 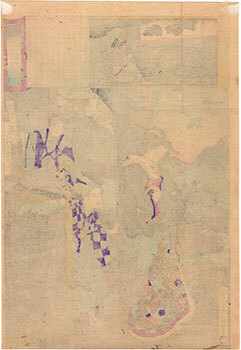 The work on Japanese washi paper (和紙), printed by the publisher Kobayashi Tetsujiro (小林鉄次郎), is in very good general condition thanks also to a relining carried out on the back.